PRIME Minister Narendra Modi on Sunday said that he took the decision for the Indian Air Force to conduct Balakot airstrikes as he thought that ‘the game’ should be played from where terrorism is being remote-controlled. Addressing a ‘Main bhi Chowkidar’ event, he said Pakistan is in a fix because if it acknowledges the airstrikes, it will have to accept that there was terror camp there. “They have been saying that there are no terror camps. Now they have to hide it. They are not allowing anybody to go there. We’ve been told Balakot area is being reconstructed by Pakistan to show that a school is being run there, so that people can be taken there and shown that no terror camp existed there,” he said. Those abusing Modi on Balakot airstrikes are helping Pakistan with their statements, he said. 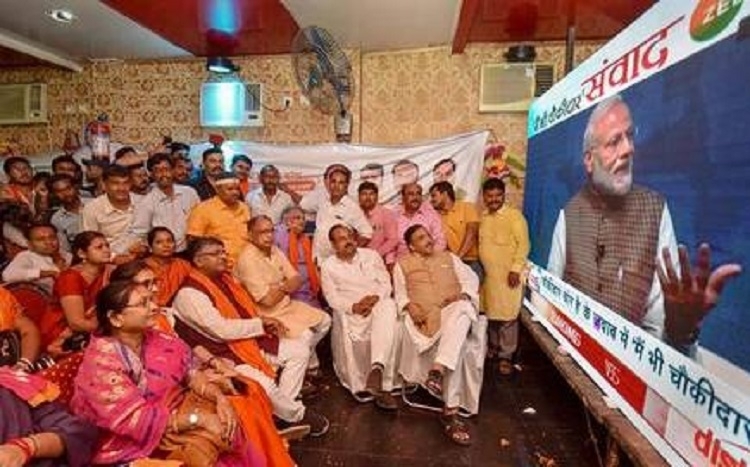 The event was beamed across the country at 500 places where gatherings of BJP workers, professionals, chowkidars (watchmen), traders, farmers among others were listening to Modi and interacted with him through video-conferencing. “We have been suffering from terrorism for the past 40 years. They came and carried out killings in Mumbai and Uri. We know who is responsible for this. I thought that how long all this will go? Then, I decided—Yeh Jahan Se Control Hota Hai, Khel Wahin Khela Jaayega,” he said in response to a question about airstrike at terror camps in Pakistan’s Balakot by the Indian Air Force (IAF) on February 26. Praising Indian Armed Forces, Prime Minister Modi said: “I have not done Balakot strikes but or jawans did this. We salute them. I was able to take that decision because I have complete trust in our Armed Forces. I have trust in their ability and discipline and I know what they can achieve.” Tensions between India and Pakistan escalated after Indian Air Force fighter jets bombed terror group JeM’s training camp near Balakot deep inside Pakistan on February 26. In a strong message to those who are absconding after looting the country, PM on Sunday said that he would ensure that they return every penny to the country. “Those who have robbed the country will have to return every single penny. Since 2014, I have been doing all things to ensure absconders face the law of the land,” he said. “They are being sent to jails. Some are out on bail and asking for some dates. They are absconding due to fear,” said Prime Minister Modi. “Because of our laws, they are returning the money. They did corruption of Rs 9,000 crore and now Rs 14,000 is in the Government’s custody. Their properties—wherever in the world—will be seized,” he said. The Prime Minister said: “Some people say in foreign courts that the condition in India’s prisons is not good. I cannot give a good prison to the prisoners better than where the Britishers had kept Gandhi ji.” “Our principle has been to reward honesty. From the very first day, we ensured that honest taxpayers do not face any difficulty. I promise to the countrymen that those involved in scams will be punished,” he said. Highlighting the success of his Government, Prime Minister Modi said that India is now the sixth largest economy in the world. BJP would do a Tripura in Odisha, surprise country, says Modi: PRIME Minister on Sunday exuded confidence that the BJP would form Government in Odisha, and said results of the upcoming elections in the State will ‘surprise’ the country, as was the case in Tripura last year. 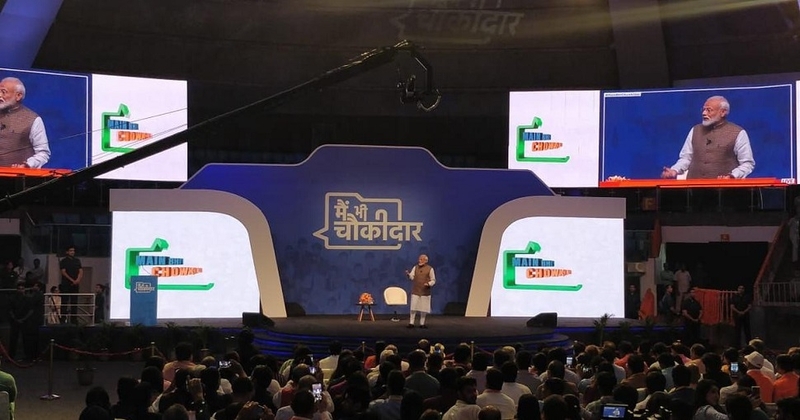 The PM was speaking at an interactive session during a ‘Main bhi Chowkidar’ event, through video-conference from Delhi. “Odisha will surprise everybody in the country this time... It will be a second Tripura,” Modi said, implying that the BJP is poised to post an impressive show in Odisha, where Assembly election is slated to be held along with the Lok Sabha polls next month.